Intellectual Property Issues in Chess Games. Journal of Intellectual Property Law & Practice, 2011, Vol. 6, No. 10 Oxford University Press. (co-author Professor Neil Orkinn) July 2011. Analysis of the intellectual property devices, particularly copyright, available for protecting chess games. Legal Moves: Melekhina on Chess and Law School. Chess Life Online. March 16, 2014. Introspective article discussing the common strategic thread underlying the competing demands of two divergent career paths. 5 Skills Chess Teaches Kids. chess.com. February 9, 2015. (featured article and cover). The importance of integrating chess into the education curriculum. Interview with GM Chuchelov - Caruana's Coach - 2014 Sinquefield Cup Coverage. ChessBase. September 7, 2014. Behind the Scenes of the Sinquefield Cup. ChessBase. September 10, 2014. 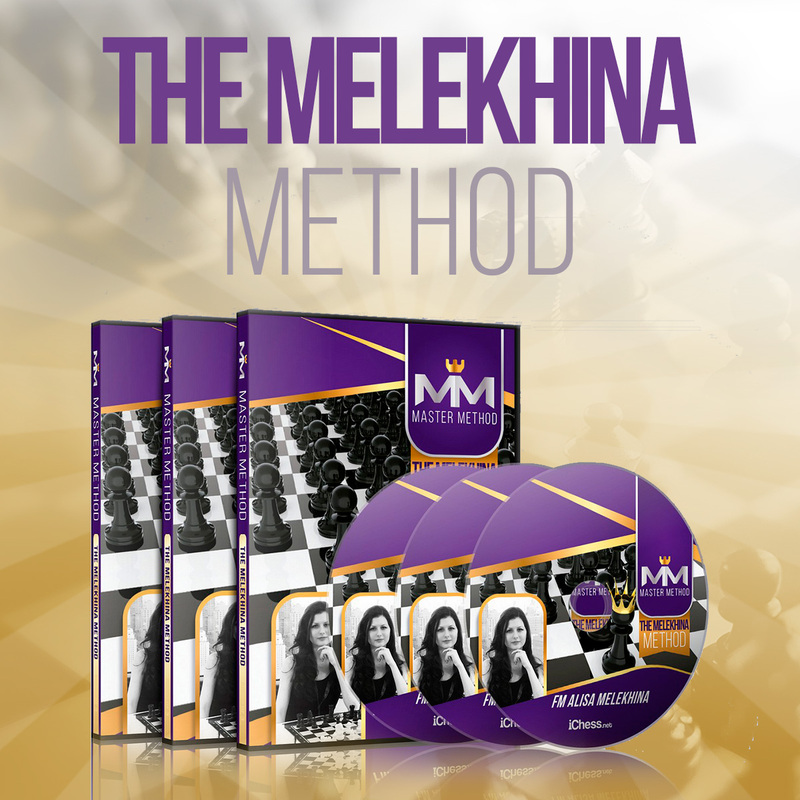 Melekhina on the Millionaire #1: Impressions from Vegas Chess Life Online. Oct. 20, 2014. Women's World Team Halfway Report: U.S. Women Off to a Solid Start Chess Life Online. April 24, 2015. Nakamura and Krush, Who Else? 2015 U.S. Championships Report, New in Chess Magazine. June 2015. Millionaire Chess 2: High Stakes Chess Life Magazine. January 1, 2016. Beating the Sicilian in 21 Moves or Less with the Alapin: 1. e4 c5 2. c3: A sweet and simple cure to the Sicilian Chess Life Magazine. October 1, 2014. 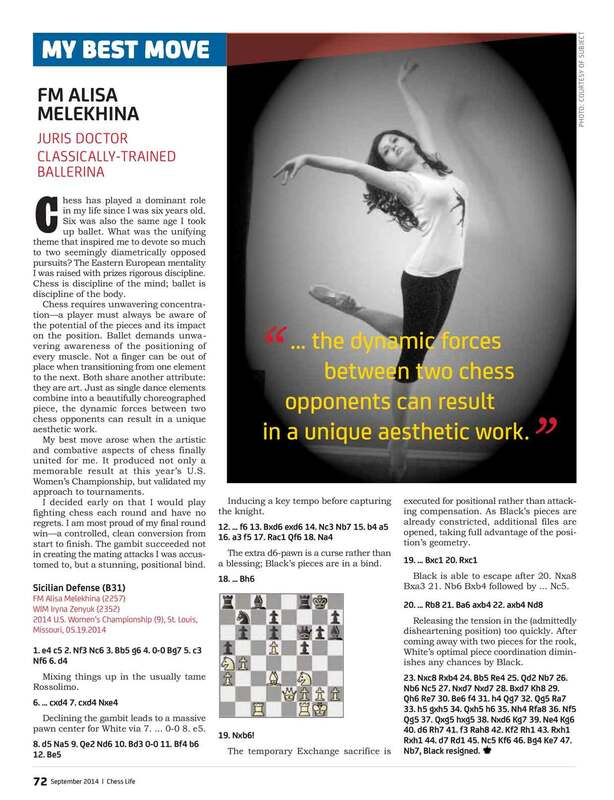 French Advance, Chess Life Magazine. October 1, 2015. Melekhina Method: Practical Chess Powerplay Course, ichess. April 2017. The 15-hour comprehensive course on practical power play is an essential for any tournament players looking to improve their results and reach the next level in their chess. The audience is equipped with the fundamentals of chess understanding, and more importantly - a clear method - to pave the way for self-improvement. First, Alisa provides a not-to-miss survey of various chess styles - from attacking to positional to universal - so that players are aware of all that chess has to offer in choosing which styles are best suited for their individual play. Using this as a building block, Alisa next covers must-know chess structures such as ones conducive to f4-f5 breaks and Caro-Slav structures. The goal is to arm the player with plans that he or she can use in unfamiliar territory and further provide guidance on structures to build an opening repertoire around. The second part of the course focuses on chess skills that you won't get just from learning theory. The true tournament player must be able to fight back from tough positions and convert advantages into extra points. Alisa competes the series by providing an insight into her method for the ultimate mode of self-improvement - self-analysis and critique. In effect, Alisa champions an insightful bottom-up educational approach in which players should cultivate their style of play based on fundamentals, rather than focusing on bolstering an opening repertoire that may be a wrong fit and that may have been arbitrarily adopted in the first place. Players are encouraged to introspect on their chess preferences in shaping their practical play for the ultimate success.